For all the technical details on the sculpt (absolutely no complaints) and the articulation (there's plenty of it, but it might require some boiling/freezing to get moving), please visit our Decimus Hrabban review - this review is just about the differences on one specific variant. When the Four Horsemen launched their Kickstarter, they had six birds ready to go - the raven, of course, but also five others. Our first variant is "Griffus," based on the mythical gryphon (which was itself based on the misinterpretation of triceratops fossils). 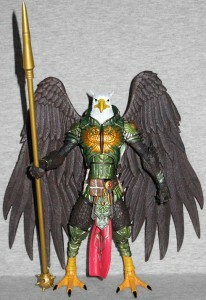 Griffus has dark brown feathers, and his armor is metallic green outlined with bronze, then finished with gold accents. His feet are bright yellow with black nails, and his loincloth is red, adding a flash of energy to an otherwise reserved colorscheme. The variant birds don't get the same ornate weapon as Decimus - just a staff with the spiked mace head on one end, and a sharp spike on the other. The gryphon head could easily be mistaken for the eagle's, if not for one small feature: the pointed ears that poke out the back. They're the same white as the features covering his head, so they tend to get lost; maybe a tan paint app would have helped them stand out? His glossy yellow beak matches his feet, and he's got some very stern eyes. 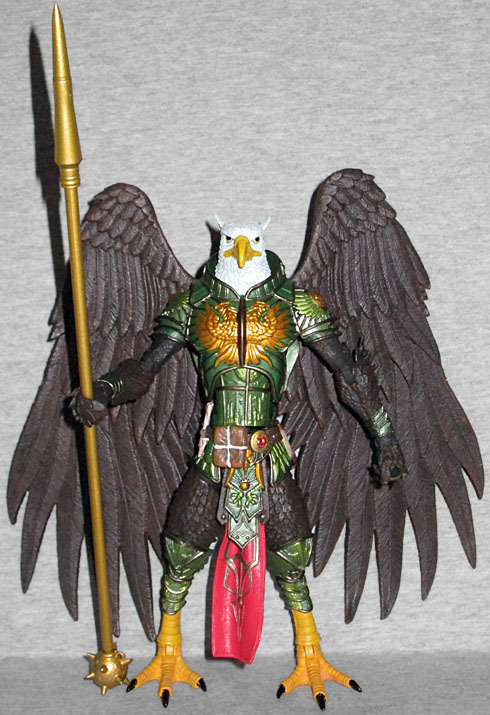 Also, if you're getting the wings the Four Horsemen are offering, the white ones look just as cool on him as the dark brown. They match his tail feathers. I'm not sure why, but Griffus feels very... fiscal. Maybe it's the green and gold, but looking at him makes me think of money. Like, if all the birds had jobs, he'd be their treasurer. 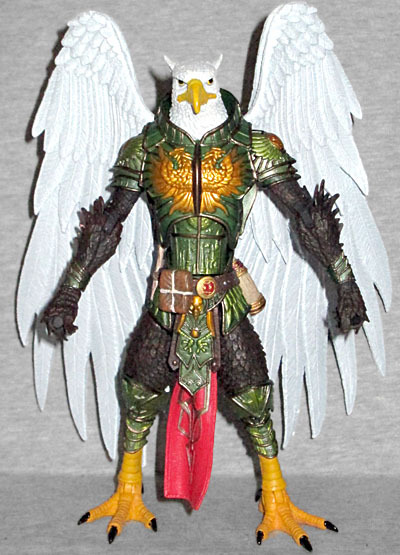 I also wish he had some extra neck fur, like Azazel and Haures had, to help sell him as a gryphon rather than an eagle, but he's still a nice variant. This entry was posted in blog exclusive review, FANtastic Exclusive and tagged Gothitropolis. Bookmark the permalink.